Rent the Runway is a great place to look for dresses, especially for weddings and other events. Instead of buying a dress you may only wear once Rent the Runway allows you to rent the dress for a fee and then you can return it. How great is that? I love that your closet will not be over run with extra clothing. This week we are talking about weddings in the Hamptons and which styles we love. The Shoshanna is a beautiful dress that can be worn for a day or night time event. It is simple but beautiful at the same time. The short length can show off your legs and the beautiful shoes you will chose to wear with them. For only $70 you can rent this dress to wear to the summer wedding event of your desire. The next dress that I really love is the Hunter Belle Maxi dress. This dress is longer in length than the Shoshanna. It is a lovely pink color with small cut outs on the side. It also has a great zipper down the back. This dress is sure to make you look like a super star this summer. This dress is available in sizes up to a 12 and it is available to rent for $80. 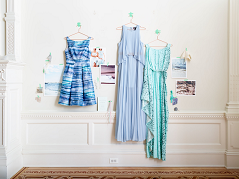 If dresses are not your favorite Rent the Runway also offers a variety of jumpsuits that are wedding appropriate. I really like the Tiny Tulip Jumpsuit. It would be great for the spring or summer. It is simple yet elegant and would be great for the majority of weddings. This jumpsuit comes in sizes 0 up to a size 10. You can rent this jumpsuit for $65. To check out this website and their amazing line of clothing click on one of the above links and don't forget you can get $25 off your first rental of $75 or more.